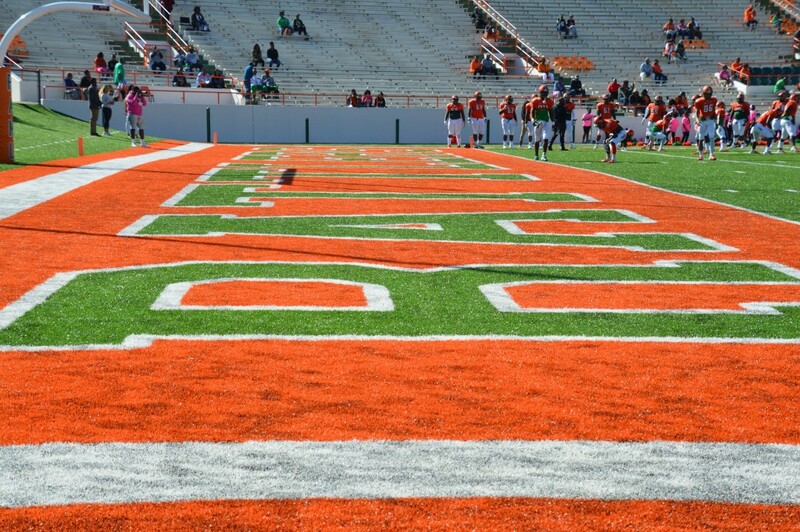 The endzone in Bragg Stadium before a game against Morgan State on Oct. 27. On Sept. 29, Christion Abercrombie, a linebacker for Tennessee State University, suffered a head injury against Vanderbilt. Moments after arriving at the hospital he had to undergo emergency surgery because the head injury was so severe. Nearly a month has passed, and Christion has improved, his condition has gone from critical to stable. He is talking on his own and now breathing on his own, but he still has a long way to go before he has fully recovered. “They want you to be tough, they want you to be a hard player. Whatever you go through, you got to get through it,” says Florida A&M linebacker Derrick Mayweather. That is the stigma of football players, the expectation is that they are supposed to be tough and show no weaknesses, regardless of how they really feel. Especially as it pertains to injuries they sustain during games, more specifically concussions. Concussions are a traumatic brain injury that can hinder your brain function. They are temporary but can cause headaches and issues with concentration, memory and coordination. They are prevalent in contact sports, but much more common in football since it is such a violent sport. According to the NCAA, 7.4 percent of injuries sustained by football players are concussions followed by head, neck and face injuries at 4.3 percent. Student-athletes who have symptoms and behaviors associated with concussions are to be removed from practice or play and be under the care of a trainer or physician. Furthermore, players must participate in concussion management such as a clinical evaluation of cognition and balance, then be withheld from athletic activity and rehabilitated depending on the severity of the injury. Some concussions are hard to diagnose instantly, some concussions result in loss of consciousness and others do not. Signs of concussions can include ringing in ears, pressure in the head or a headache, delayed responses, vomiting, and confusion. In such a fast-paced sport and hectic environment, it can be difficult to assess a player and make sure that they’re okay. With protocols and different rules in place to ensure the safety of the player, why are concussions still so prominent in this sport? The players. Their transparency about the extent of their injuries to trainers blurred by a love for the game, a love that is extremely deadly. “I keep playing because it’s not about me, it’s about my family, I’m on scholarship and it’s something that I love to do, I don’t think about the risks,” said FAMU defensive tackle Demontre Moore. The risks that can cause death, either instantaneously or slowly, sees no age depending on how hard the collision and impact of the hit. Chronic Trauma Encephalopathy, or C.T.E as its more commonly referred to, is a degenerative disease caused by repetitive head trauma. The condition can result in memory loss, suicidality, vertigo, impulsive behavior and the declining of mental abilities. Additionally, in CTE, Tau protein forms clumps that spread through the brain and kill brain cells, the development in these proteins can persist long after playing has stopped. Symptoms of CTE normally do not show until years after head injuries have been sustained but has been seen in athletes as young as high schoolers. Dr. Ann McKee, a neuropathologist tested 202 football players and more than half of them were found to have CTE caused by repeated blows to the head. Lineman, running backs and defensive backs were at the top of the list closely followed by linebackers, quarterbacks, wide receivers, tight ends, then place-kickers and punters. These players all deceased and ranging in ages from 23 years old to 89 years old. With all of this information at our fingertips, it is important that the issue is addressed continuously to save the next generation of players from getting hurt and losing their lives early. There is still more research to conduct but there should be no more speculation that this is a big issue in football -- it is a big issue, that can be confirmed. “CTE isn’t on my mind in the middle of a game, I live in the moment, I don’t think about me being 50,” said FAMU quarterback Ryan Stanley. With college and professional players showing more severe effects, cognitive, mood and behavior symptoms and death as a possibility. It is something that should be considered.